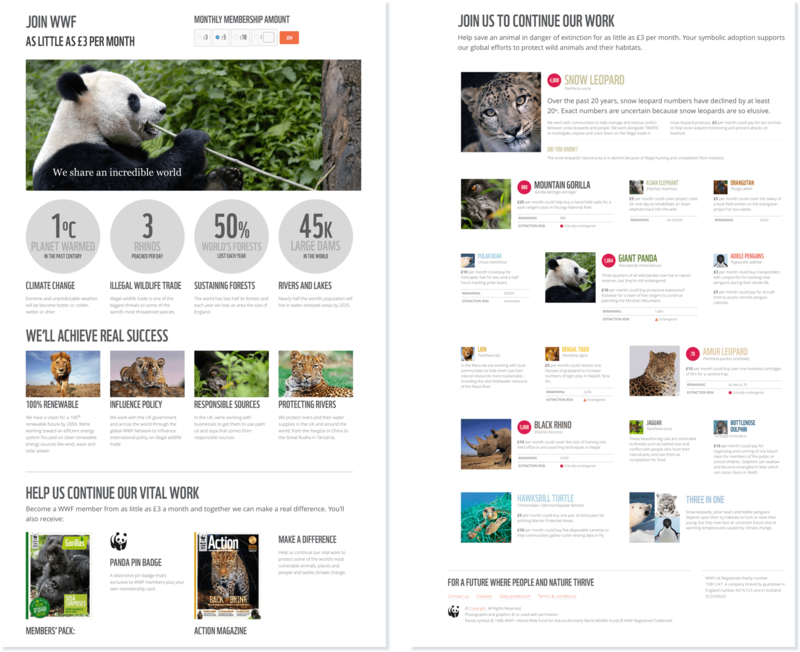 I worked with the UK team at WWF to redesign their online adoptions, donations, and membership to create an engaging user experience and more compelling reasons to participate. L – The new fundraising page design makes adopting an animal clearer and explains what the money you donate might buy. 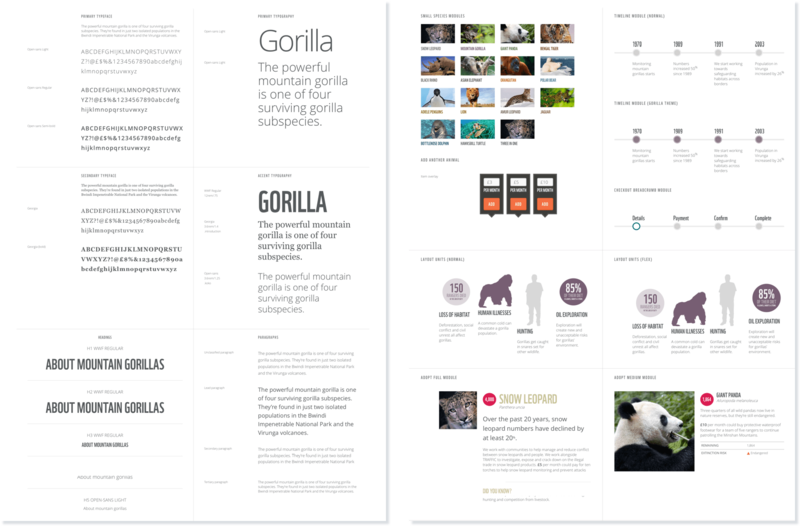 R – Bamboo—the living style guide I designed for WWF—explains how to use the visual assets I created during the project. 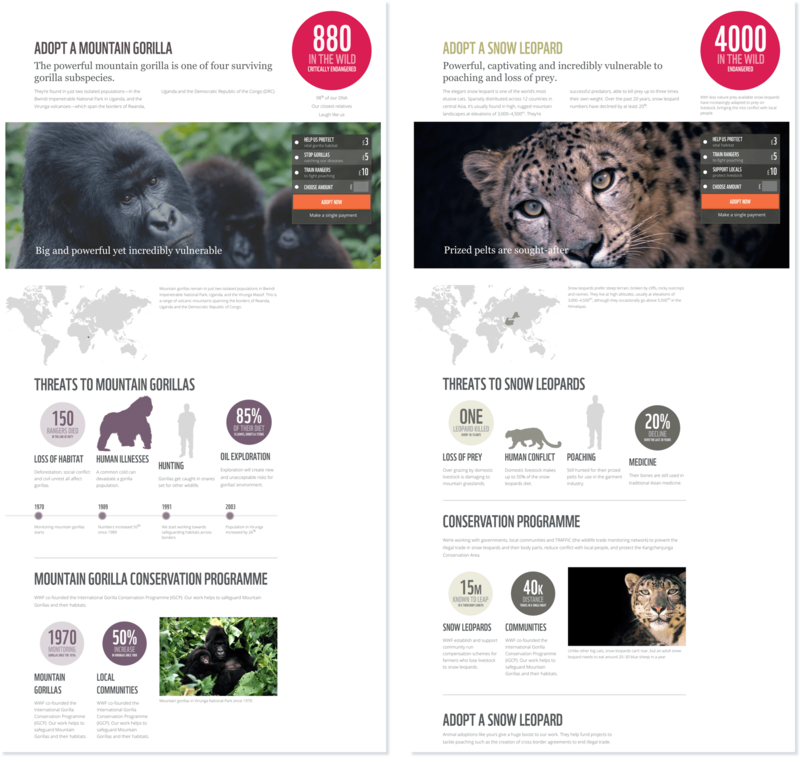 As a life-long supporter of WWF helping to save threatened species—including my beloved mountain gorillas—I was over-the-moon when they asked me to redesign their UK fundraising pages. Our aim was to increase contributions and reduce failed transactions. I did this by designing visually engaging pages and improving a supporter’s experience with better content and a smoother payment process. 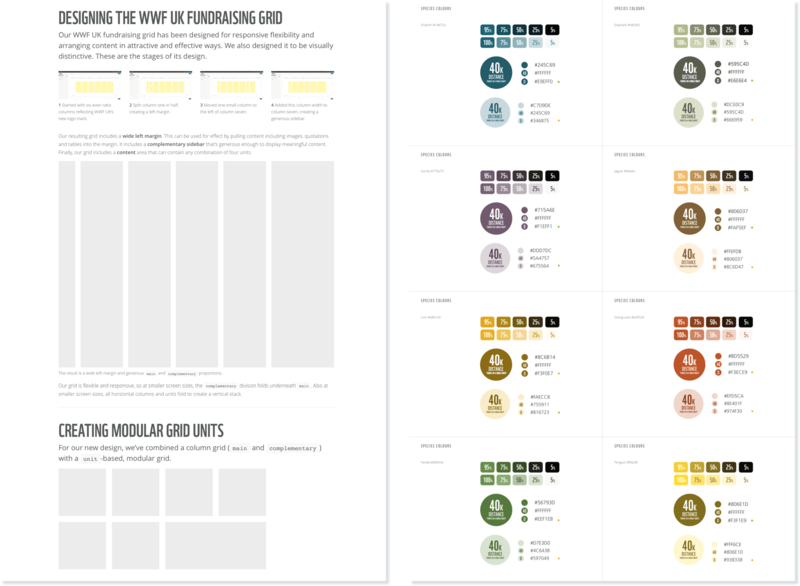 I designed a bespoke responsive grid, a colour system that includes colours for each of the species their supporters can adopt, a living style guide WWF named Bamboo, and new templates for all fundraising pages. With so many websites today looking the same, I wanted my designs for WWF UK to be different with the aim to draw people into their content through visually distinctive page designs. Above – I made each species page unique by including text and graphical elements in its signature colour. I combined a bespoke column-based grid with a field-based grid to create distinctive, flexible layout units. Although WWF UK produce wonderful content in their offline magazines, membership packs and updates, very little of it is used online. I focussed on that compelling content to improve the success rates of their donation and membership pages. I spent several weeks improving the experience of using WWF UK’s fundraising payment pages, adding rich content-filled sidebars and callouts and making the process of adopting, adding new species and joining WWF easier. L – Their previous website had no page explaining the benefits of joining WWF, so I created one. R – For a new adoption page, I created a hierarchy that starts with the most endangered species. Sadly, this list includes mountain gorillas. My redesign of WWF UK’s fundraising didn’t stop with their web pages, it extended to designing their content too. Above – I edited their written copy to give it a friendlier tone of voice and created graphical callouts and information panels to carry a species’ story all the way through the payment process. WWF UK were impressed with the living style guide that I created for the fundraising design project that they adopted it charity-wide and called it Bamboo. 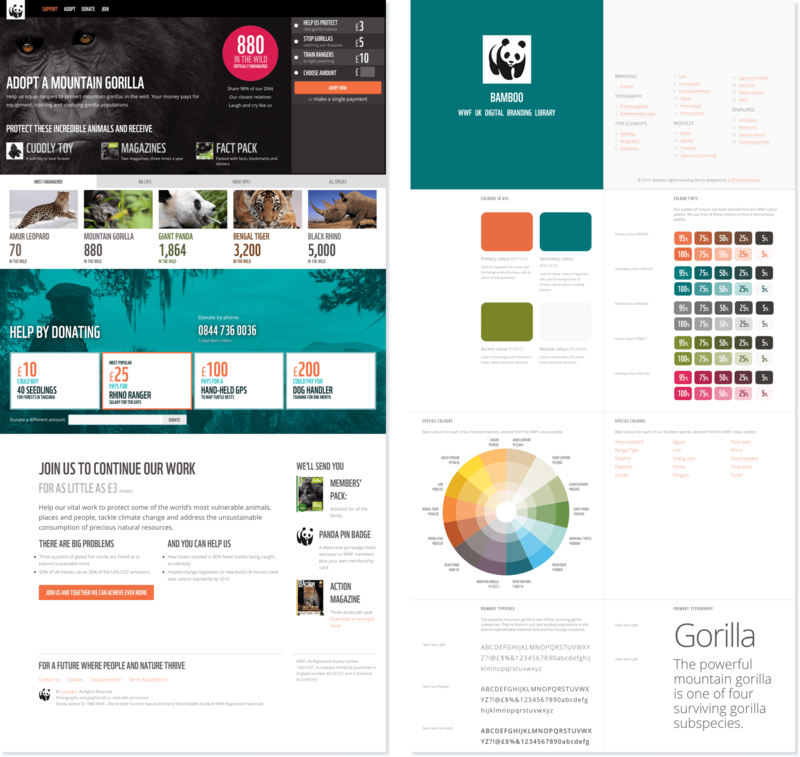 Above – Bamboo will help WWF UK maintain consistency and save both money and time when developing websites in the future. L – Bamboo includes explanations of not just the ‘how’ but also the ‘why’. L – Detailed instructions on how to use the colour system, including information about accessibility. I’m immensely proud that my pioneering work is paying off for WWF UK and hope that other charities will adopt a similar approach. 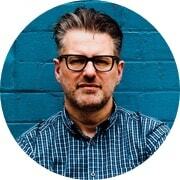 I’m Andy, and for 20 years I’ve worked with well-known brands, charities, and businesses large and small.